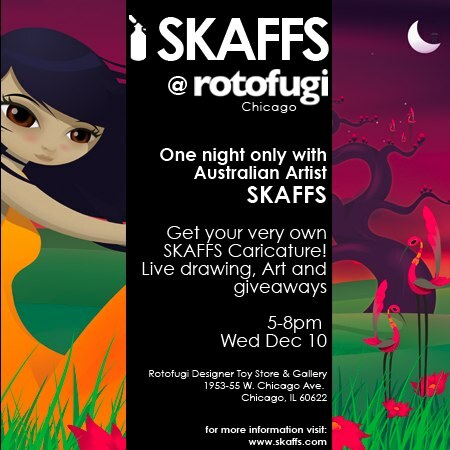 Our boy Luke Feldman is going to be having a one night only gig in Chicago at Rotofugi on Wed. Dec. 10. If you're in the area, be sure to stop by and watch Luke do his thing. I've witnessed it briefly at Wondercon and it's pretty friggin' amazing (see)! Can't make it? Me too, but no worries. Luke's got other things up his sleeves to keep the rest of us entertained. 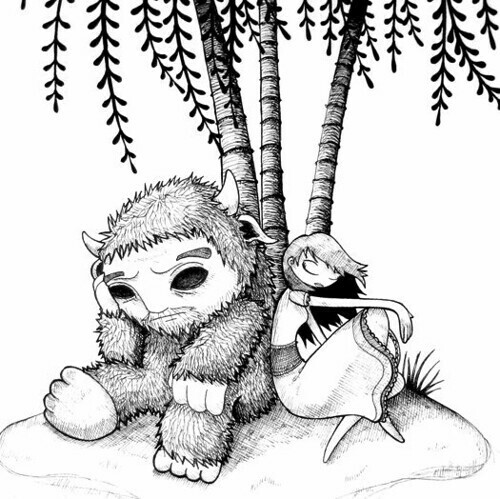 Recently he's created a piece based on Maurice Sendak's "Where the Wild Things Are." This is available at Culver City's Wonderful World of Animation Art Gallery for $400 -- clearly, for those who are collectors with beaucoup bucks to spare. Now for something on the affordable side. The lovely Ester is now immortalized on her own skate deck. Pick one up for $65 at Pop Art Skate Boards. See, $65 isn't that scary. Right? Mmm hmm. So you have the Pantone stunnaz, cellphone, mugs, cuff links, limited edition bag, the flash drives and all the other crazy-cool gear, top off your collection with some kicks. Hang with your green childhood roll dawg frog and immortalize yourself as a Muppet! Finally, my prayers have been answered! 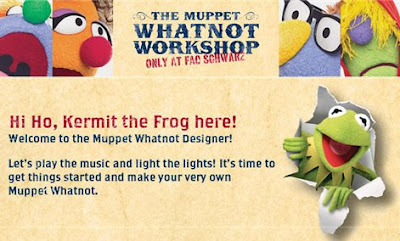 FAO Schwarz is giving you the chance to build your own "Muppet WhatNots." You pick the color of the muppet, the type of eyes, hair and outfit. 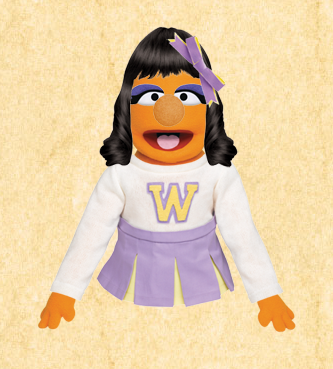 Okay, your Muppet WhatNot doesn't need to look like you per se, but shouldn't you also join in on the alter ego craze?! totally going on my wishlist for this holiday season. 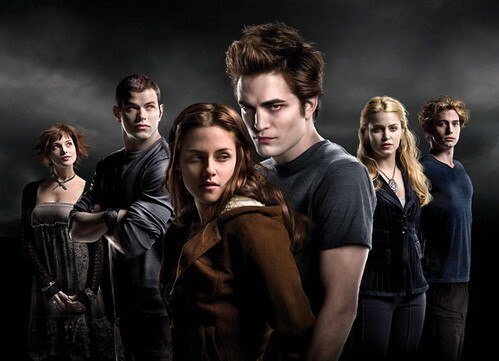 Not since Harry Potter has there been a frantic frenzy over a film adaptation of a book series. Though Twilight is getting hailed as the new Potter and it's author, Stehpenie Meyer, the new J.K. Rowling, one can't compare either: it's peaches and plums, really. * For either "Edward" (Robert Pattinson) or "Bella" (Kristen Stewart) signings, you must be one of the first 500 to purchase the $30 Twilight Tour tee in person the day of the signing to get in. * For the "Jacob" (Taylor Lautner), "Laurent" (Edi Gathegi), and "Victoria" (Rachelle Lefevre) signings, you must be one of the first 750 to purchase the Twilight Tour tee in person the day of the signing to get in. 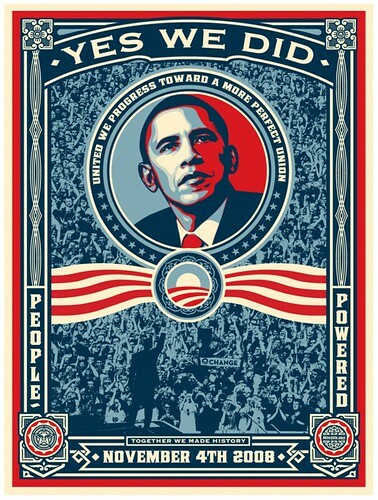 To commemorate the historic event that took place this Tuesday, Nov. 5, MoveOn is distributing free stickers celebrating Barack Obama's groundbreaking victory featuring the art of Shepard Fairey -- who designed the Obama "Hope" posters. For a $3+ donation, you can get 5 stickers OR for a $20+ donation, you can get 50 stickers. There are also 5,000 posters of the "Yes We Did -- Victory!" available starting Saturday, Nov. 8 at 12:30 p.m. ET. Each print is hand numbered and the first 1,000 are signed by Fairey himself. Those who donate $500 or more will receive a signed print while supplies last. $80+ donations will receive an unsigned poster. All donations from either the stickers or posters will help MoveOn support Obama's future plans for the good 'ol (and progressing) USA in transitioning the country to a clean, green-energy economy, ending the Iraq War in a non-wreckless manner, and providing affordable health care to all Americans. The Party's Over, time to clean up! 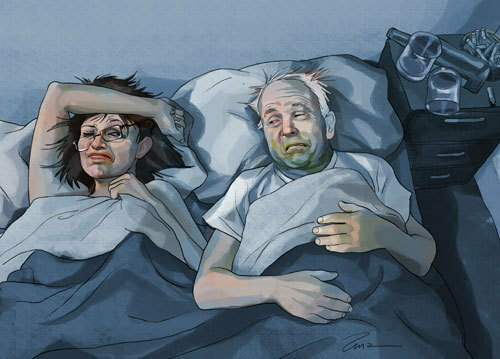 Writer-Illustrator Zina Saunders is known for her quirky portraits based on current figures. 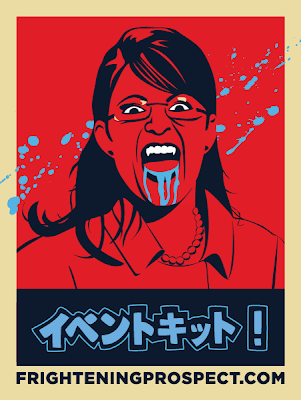 She has recently collected her pictures of the McCain/Palin campaign in a 40 page full color book, "The Party's Over." The website offers a preview of the first 15 pages of the book, and the actual book includes 25 more pages featuring 20 of my campaign paintings, all of which you can see in this gallery. 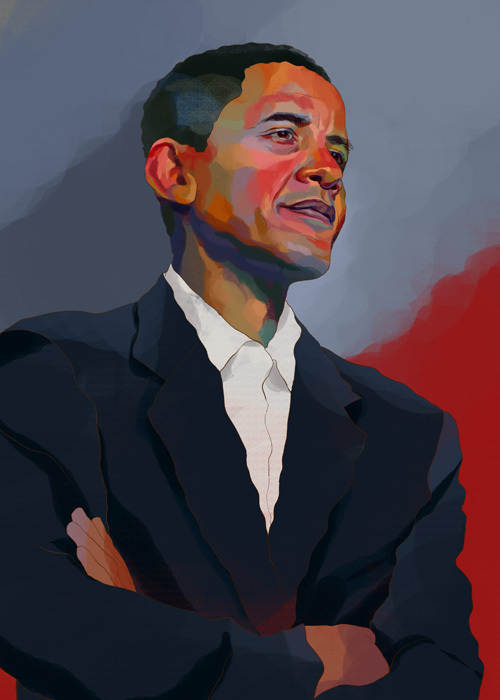 Let's hear it for Hope, Change and Progress! 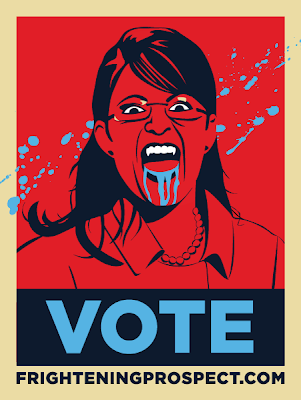 Suffrage or Suffer: VOTE TODAY or expect A Frightening Prospect! VOTING DAY IS TODAY! Do it or forever hold your war.